The Sequim Valley Airport is for Sale. You’ll find more maps, events, and documents in the “Detailed Information” section. The Sequim Valley Airport is Sequim’s pride and joy and has been a magnet for pilots throughout the region for over 30 years. The location was selected for its ideal flying environment, including its large level valley area between the Olympic Mountains to the south and the Strait of Juan de Fuca to the north, just above sea level, and because it is within the famous Sequim Blue Hole (16 inches of precipitation annually which is 1/3rd that of Seattle). The Sequim Valley Airport features a 3,500 foot paved and lighted runway. Learn more on this site and from our Buyer’s Brochure, which you’ll find in the “Detailed Information” section. The Sequim Valley Airport is the No. 1 small airport on the Olympic Peninsula and arguably in the entire Northwest. There are many objective reasons pilots believe that to be true, which include the ideal location, the ideal climate and weather patterns, the engineering of the airport runways which was planned from the beginning before the property was purchased for this purpose, the quality of the paved runway and taxiways, the parking and hangars, and the ideal location in one of the most beautiful areas of the world. The Sequim Valley Airport (SVA) was the vision of the Sallee family. The founder, Jack Sallee, was a jet fighter pilot in the U.S. Military and then went on to a piloting career with Braniff International, and ended his career as a 747 captain. He passed away in 1997. Since that time, the airport has been operated by his wife Winnie with the assistance of their four sons. The airport has been a family affair from the beginning. Winnie Sallee was active in the aviation community since her emigration from England to America in 1955. As the operator of the airport until November 2009 when she passed away, she communicated with the FAA and Washington State Department of Aeronautics for technical assistance on a regular basis. She obtained the new “Airport Overlay District” which further protects airspace approach and departure paths around the airport along with some modified land uses. Andrew Sallee is the current President. In 2010, a webcam and 24 hr self service fuel was added. The website has been enhanced. Future plans include a possible, GPS approach, hangars and restaurant. 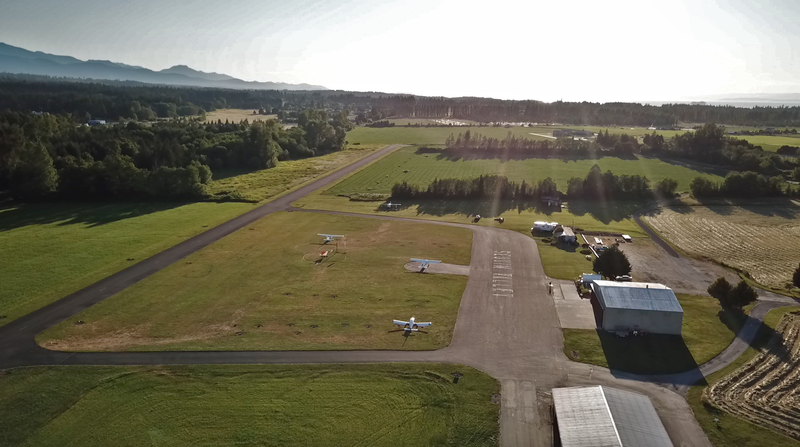 Sequim Valley Airport features a 3500 foot paved and lighted runway. This privately owned airport and residential airpark which is open for public use, and tie downs are available. There is a 24 hr self serve 100LL Avgas available using Phillips 66 and most major credit cards. Learn more about the SVA, past events, and the opportunity to purchase the airport at the “Detailed Information” section.